Paul and I have been extra busy the past month that I was actually looking forward to spending one whole day just with him. Sorry GI Joe but for me the highlight of the evening was actually dinner. Since we rarely get to go to Greenbelt because we are so comfortable dining and dating around Greenhills, I know I have to make our visit worth it. We were both craving for local Filipino dishes and I was ready to settle for either Cafe Bola or Recipes even if I've tried both in numerous occasions. Then Paul insisted that we go to Sentro 1771. I gave him a huge huge hug and picked up my pace before he changes his mind. Inside Sentro 1771, which by the way was voted as one of the top restaurants in the Philipines by the Miele Guide for 2008, we were ushered to a window seat where we had a good view of the 2nd floor fountain. I studied the menu while Paul happily munched on the complimentary sunflower seeds. Thankfully, the menu was laid out in such a way that there are mouthwatering images of the restaurant's best-sellers. I also liked the little icons that they put beside certain dish to say if it's Vegetarian or a House Specialty. I then focused my attention on all those with the House Specialty icon. My first order was the famous Corned Beef Sinigang that I've been hearing so much about. Second pick was the Rated GG and lastly, I got the Fried Kesong Puti (Php. 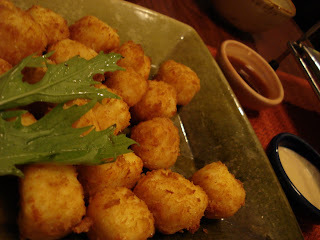 250) as an appetizer.I felt my stomach growling as soon as I handed over the menu to our server. Within minutes, another server approached our table and gave us a small teacup. She asked us to try the soup broth and see if the sourness of the Sinigang was just right for our taste. I was totally impressed. :) One sip, I liked the hit of the sour tamarind which later left a calming effect on my taste buds. Paul and I gave her our thumbs-up and she returned to the kitchen to prepare the rest of our soup. Paul and I are both cheese lovers. Name it, we love it! Since we're at a Filipino restaurant, what better way to enjoy our love for cheese than to indulge in 16 bite size Kesong Puti nuggets that we dunked into either a spicy guava sauce or a creamy garlic dip. I love Kesong Puti and this particular creation by Sentro 1771 was a winner! The two dips perfectly complemented the salty cheese that I can't even decide which one is better. From salty cheese, we went to sour soup. 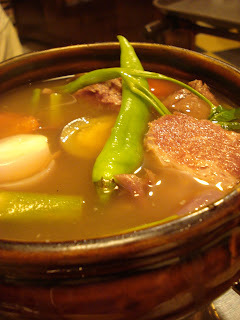 Our Corned Beef Sinigang (Php. 420) was finally served. I love the comforting effect that a Sinigang (soup cooked with tamarind) soup gives. The corned beef was so tender that there is no need to exert much jaw effort while chewing on the meat. At this point, I was glad that we have a cup of rice to go with this yummy sour beef soup. Lastly, for our seafood, we chose the Rated GG (Php. 230) simply because I'm curious on how Sentro 1771 can give a gourmet touch to our everyday seafood staple. To be honest, I rarely get to eat galunggong and this upgraded style was a welcome change. 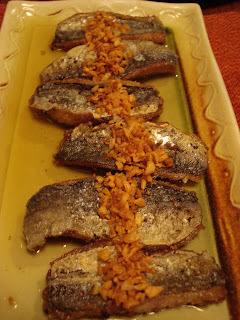 This dish reminds me of my family's favorite Spanish Sardines on Olive Oil. Imagine six boneless galunggong strips topped with crispy garlic bits that I happily mixed into my rice to make it more flavorful. Sentro 1771 is located at the 2nd floor of Greenbelt 3, Ayala Center, Makati City. You may contact them at 757-3940. Hi Fran! I'm glad you tried Sentro--and I guess it's okay to try the classic, signature dishes but next time you get to go to Sentro (there's also one in Serendra), I highly recommend you try the newer dishes, the amazing desserts, and their super impressive breakfast.